Pure gold does not react with oxygen, which means it is unlikely to tarnish. 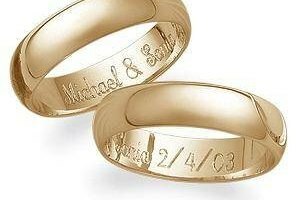 However, many pieces of gold jewelry have other metals mixed in, causing the gold to become tarnished or discolored. 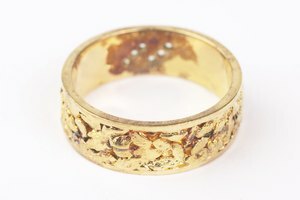 You can easily fix a piece of tarnished gold jewelry. All you have to do is carefully clean it to restore its original color and shine. Pour three or four drops of a mild liquid dish soap into a bowl of warm water. Place the gold jewelry into the bowl. Soak the gold for five minutes. Gently rub the gold jewelry with your fingers or a cotton swab to remove any discoloration or buildup. Rinse your gold jewelry. Place it under warm water and rinse off any remaining soap residue. Dry your jewelry with a clean cotton towel. Don't use tissues or paper towels because they contain particles that could scratch the gold. 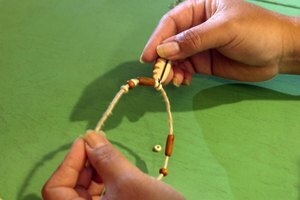 Place the jewelry on a clean cloth and allow it to finish drying overnight. You don't want any moisture on the gold that can lead to tarnishing. Rub the gold with a jewelry polishing cloth. 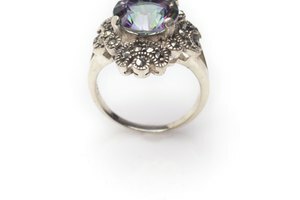 You can buy this at any jewelry store. This brings out the shine in your gold. Rub it in straight lines. Do not use a circular motion because this can cause patterns to show up on the gold. You can use a soft baby toothbrush to clean the gold, but make sure you rub gently so it does not scratch. Jewelry cleaner is available from most jewelry stores. Follow the directions on the bottle for the proper cleaning method. 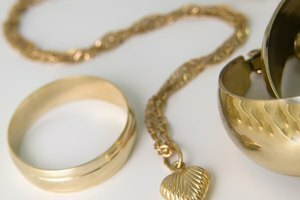 You may need a professional cleaning if your gold jewelry is still dirty after cleaning it at home. Never use toothpaste or baking soda to clean gold jewelry. Do not wear gold jewelry in a swimming pool or hot tub because exposure to chlorine can eventually turn your gold a black color. Take gold jewelry off in the shower. The soap can leave a dull buildup on the gold.